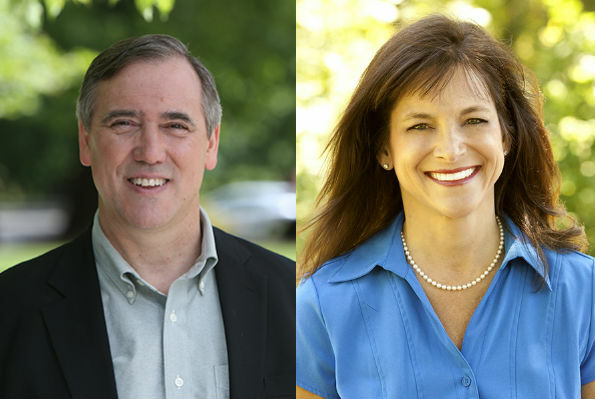 The race between incumbent Sen. Jeff Merkley and his opponent Dr. Monica Wehby is heating up. Merkley, who served five terms in the Oregon House of Representatives before defeating Gordon Smith to become Oregon’s junior senator in 2008, was the first federal candidate to be cross-nominated by the Independent Party. Whereas, if elected, Wehby, currently the Director of Pediatric Neurosurgery at Randall Children’s Hospital and a former member of the board of the American Medical Association, would be the first female senator from Oregon since 1967. Below, we cut through the rhetoric to get at the core of what’s fueling each campaign (as well as some of the words, since each candidate went over the requested word count). Follow our continuing political coverage by visiting the Election 2014 tab at BendSource.com. Source Weekly: Why did you decide to get into politics? What are your long-term political aspirations? Jeff Merkley: In the summer of 1976, I interned for Sen. Mark Hatfield. I saw senators come together to take on the big issues facing America. It was an amazing experience that inspired me to seek public service as a career. SW: What three things do you most hope to accomplish if elected? JM: My top priority is creating good-paying jobs. I’ll do everything I can to support small businesses and manufacturers, and level the playing field for American workers. I am fighting to make college affordable for every student. I want to ensure the promise of Social Security and Medicare is kept for our seniors. SW: What are you doing right now in service of the issues you’re most passionate about? JM: I passed legislation to help fund improvements to our aging water infrastructure because it creates Oregon jobs, and I’m working to pass the Bring Jobs Home Act to bring jobs back from overseas. I’m fighting to give students the same low rate for student loans the big banks get when they borrow money from the Federal Reserve. I am working to pass the Medicare Protection Act, and I have authored a bill to restore the purchasing power of Social Security. SW: How will you balance protecting the environment with preserving employment opportunities? JM: We can and must do both. For example, we can improve our environment and create jobs by investing in renewable energy and energy-saving retrofits for our homes and buildings. These are jobs that can’t be outsourced. SW: Why should Central Oregonians trust you to represent their interests? JM: I come from Myrtle Creek, a timber town, where my dad worked at a sawmill. I learned the value of a good-paying job early on, and I’m focused on growing the middle class. I am working with local leaders to come to a solution for the Bowman Dam to create more irrigation water and a healthier river, and in the Senate I took on H2-B abuses and passed reforms so that Oregonians are hired for Oregon timber jobs. SW: On which issues are you most conservative? On which are you most liberal? JM: This is not the way I think about issues. I judge a bill by how it will affect Oregon’s middle class families. SW: What is the single most significant difference between you and your opponent? JM: I’m fighting for Oregon’s middle class families, while Monica Wehby’s agenda helps only the most privileged, at the expense of the middle class. She put out a plan that would give huge tax breaks to millionaires and corporations that ship jobs overseas. SW: What is your opponent’s best quality? JM: She has chosen to work in a demanding medical field and to focus on helping children. SW: Your opponent has been critical of Obamacare. In what ways has it succeeded? Failed? JM: The rollout of the ACA was a debacle, but the law has helped hundreds of thousands of Oregonians access healthcare for the first time. My opponent wants to scrap those reforms, putting insurance companies back in charge of your healthcare. SW: With one of the driest winters on record, and one of the hottest summers, Central Oregon is feeling the effects of climate change. What can/should the Senate do? JM: A huge cause of climate change is carbon pollution from coal-fired power plants. I strongly opposed the Republicans’ efforts to gut the Clean Air Act. SW: Favorite politician—real and fictional? JM: Sen. Mark Hatfield and Jefferson Smith, Mr. Smith Goes To Washington. SW: PBR or IPA? JM: IPA. SW: Favorite mode of transportation? JM: My bike. SW: Ayn Rand or Howard Zinn? JM: Definitely not Ayn Rand. SW: Rolling Stones or Beatles? JM: Beatles. SW: Why did you decide to get into politics? What are your long-term political aspirations? Dr. Monica Wehby: I decided to run for office because I’m concerned with the direction our country is headed and the lack of opportunities we’re leaving the next generation. I believe career politicians are a big part of that problem, which is why I’ve promised to serve no more than two terms as a U.S. Senator. MW: If elected, I hope to jumpstart economic growth, put more Oregonians back to work, and replace our current healthcare system with a more patient-centered, market-based approach. MW: As a first-time candidate, I’m traveling the state listening to people’s concerns and sharing my ideas to address the issues most important to Oregonians. On the healthcare front, I’ve spent the last 30 years promoting solutions that enhance access to high quality, affordable healthcare at the local, state, and national levels. MW: I believe we have an obligation to leave the earth in better shape than when we got here, but we can do that without making the environment the enemy of the economy. I believe public policy should aim to balance protection of the environment with promotion of a good business climate. MW: As a doctor, I have had the privilege of working to make a difference in the lives of all Oregonians; as your U.S. Senator, I will use that same unbiased approach to represent the people of Central Oregon. MW: I don’t look at Oregon’s problems, or my solutions, as being conservative or liberal. As a government, we must ensure fiscal restraint, accountability, and common sense are what drives our legislative process. MW: Senator Merkley believes the answer to all our problems is more government and spending. On the contrary, I think that approach has led us to the current state we’re in. MW: I think Jeff Merkley’s work on behalf of the LGBT community is commendable and I would look to continue the service he’s provided that particular community of Oregonians. SW: You’ve been critical of Obamacare. Effective healthcare reform looks like? MW: Real healthcare reform involves common sense, market-driven reforms. As a doctor, I know firsthand the negative effects this law has had, and I will see to it we replace the law with an approach that allows Americans to keep the best parts of it. SW: With one of the driest winters on record, and one of the hottest summers, Central Oregon is feeling the effects of climate change. What do you think the Senate can/should do to address this? MW: We have to trust that American innovation and entrepreneurship will lead us down a path where the answer to our climate concerns does not come at the price of further job loss, higher energy prices and a stagnant economy. SW: Ayn Rand or Howard Zinn? MW: I haven’t read either’s works, but I’ll certainly put them on my list!